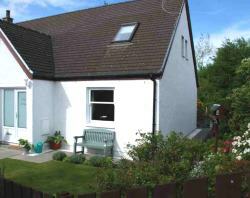 The cottage has a kitchen/dining room, downstairs toilet, upstairs bathroom with shower, and two bedrooms. The property is double glazed, centrally heated, warm and cozy in the chilly weather, light and airy in the summer. Solid traditionally built, quaint yet fully modernized. 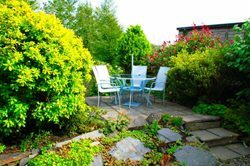 There is a lawned grass area to the front of the cottage which enjoys views of the 9 Hole Isle of Seil Golf Course and is the ideal sun trap. The garden to the rear has a raised patio area with garden furniture. Photos of Creel Cottage interior.